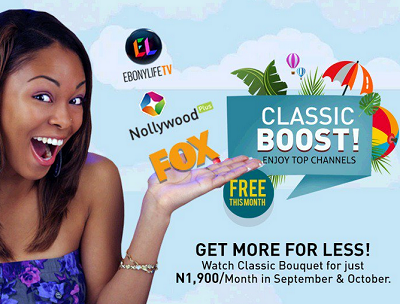 StarTimes Nigeria have announced planned reduction in subscription fee for its classic bouquet from N2,600 to N1,900 come September 1, with the inclusion of Ebony Life TV, ST Nollywood Plus and Fox and ST Kids to the bouquet. The pay-TV company also declared a one month free access for all its subscribers starting from August 1 to 31 on all decoders, irrespective of subscription status to ensure customers have access to its new channels, available on the classic bouquet. This is coming after DSTV increased their subscription fee to something subscribers are not happy about… and yet another disappoint on Sunday when DSTV and other cable TV left Nigerians hanging with nowhere to watch Manchester City Vs Chelsea… it was a moment of torture. But yesterday 6th of August, StarTimes took to their handle and sympathized with Nigerians over the price hike by DStv and stated that it will reduce its highest bouquet price from N2,600 to N1,900, while adding Ebony Life TV, ST Nollywood Plus & Fox to the list of channels. StarTimes owns a featured content platform, with 480 authorized channels consisting of news, movies, series, sports, entertainment, children’s programs, etc. The company’s vision is to ensure that every African family can access, afford, watch and share the beauty of digital TV. Good development….. If only Star times had right to EPL, then dstv won’t be doing the rubbish they are trying with Nigerians. It is nice but quite unfortunate that startimes is not as attractive as DSTV. what a very good move by ST. they’ll definitely win a few hundredore Nigerians over with this move. Trash… this was strategic! They knew they would lose customers after they lost the right to show Italian Seria A to DSTv. I won’t be using their decoder until further notice. I support an Italian team and I just want to watch Seria A! Good idea startimes. Very nice. nice move but I ain’t interested in Nigeria movie. They could have benefited alot from the Ronaldo move to Seria A. They now crashed dre price bcuz they v nothing to offer..